Raptor Resource Project Blog: How Do Bald Eagles Stay Warm In Cold Weather? 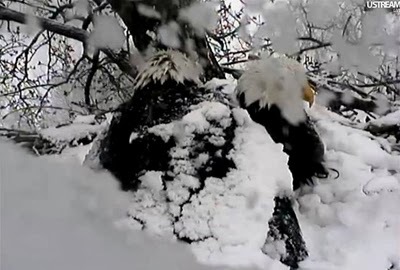 How Do Bald Eagles Stay Warm In Cold Weather? We get a lot of questions about bald eagles and cold weather. I've written a few posts on the subject, but thought I'd combine them here. Unique body features and changes in physiology and behavior help bald eagles maximize energy gain, minimize energy loss, and incubate eggs in cold temperatures. To maximize gain, eagles forage in groups, gorge food, and increase the assimilation of ingested food energy. To minimize loss, they become sedentary, seek protective microclimates, and reduce night-time body temperature. Put simply, successful eagles use the least amount of energy to get the most amount of food. Here's how they do it. Foraging in groups (or observing and following other birds on their territory) increases the likelihood that eagles will find food with less energy expenditure than if they hunted alone. Bald eagles steal prey from other eagles and birds (kleptoparasitism), an optimal behavior, at least during periods of food scarcity, for animals that forage together. Gorging food helps eagles load calories quickly and reduces the likelihood of food theft by another animal. Cold weather causes changes in blood flow. Less blood flows to skin and extremities, making more blood available for visceral organs like the stomach. This helps eagles reduce energy radiation and increase the assimilation of ingested food energy at a time when every calorie is crucial. It takes energy to fly, procure sticks, and nestorate. Reducing activity reduces energy consumption and slows metabolism. Sheltering in protective microclimates (thick brush, bluff pockets, sheltered branches, coniferous trees) reduces wind exposure. These microclimes also holds heat more efficiently than open spaces, slowing energy radiation and minimizing loss. Bald eagles reduce their body temperatures at night an average of 1.8 degrees. This slight hypothermic condition reduces the temperature gradient between their body and the environment, letting them burn fewer calories to stay warm. Eagles also have physical adaptations that help them stay warm and incubate their eggs. Feathers are wonderful insulators. The roughly 7,000 feathers an eagle grows help keep it warm and dry. Stiff exterior vane feathers zip together over smaller, fluffier down feathers, providing an overcoat of sorts to shed water and help keep heat from escaping. Underneath, down feathers trap pockets of air next to the eagle's body, where it is quickly warmed and prevented from escaping. However, some heat needs to escape during incubation. A brood patch is a patch of bare skin on an eagle's breast. Eagles can roll, wiggle, and tuck their eggs up against the brood patch, effectively transferring heat from the eagle's roughly 104-degree body to the eggs. Since the optimal temperature for incubation is 99 degrees, some heat can be lost. The eagles regulate egg temperature by alternately incubating the eggs and leaving them uncovered. An eagle's legs use counter-current heat exchange to control body temperature. Warm arterial blood flowing from an eagle's core into its feet passes cool venous blood flowing the other way. Heat is exchanged, warming the blood flowing into its core and cooling the blood flowing into its feet. The cooler blood is still warm enough to prevent frostbite, but the lower temperature reduces the gradient between its insides and its outsides, preventing excessive heat loss through its feet. An eagle's leg muscles are tucked up under its feathers, nearer the warm center of its body, and it has very few soft tissues in its long legs and feet, which are wrapped by thick, scaly skin that helps protect them from the cold. If its feet do get cold, it can always tuck them, often one at a time, underneath its feathers. Ask A Naturalist: Why Don't Duck Feet Freeze?